Today I was really tired and I put one of my oldest favorite films in the DVD-player. It's The Scarlet Pimpernel from 1982. This was one of the first films that I watched obsessively as a kid, and I still know quite a lot of the lines by heart. Well knowing the film that well gives makes me look at other tings, like the costumes for example. This film has definitely shaped my interest in the late 18th century fashion. 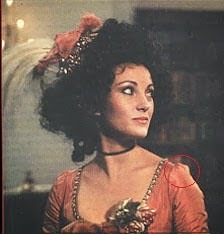 One thing that made quite happy was actually to see the sleeves of Marguerite's gowns. Quite a few of the had a bit of hump on the back, say from the middle of the shoulder and down. There was also some serious wrinkling going on. 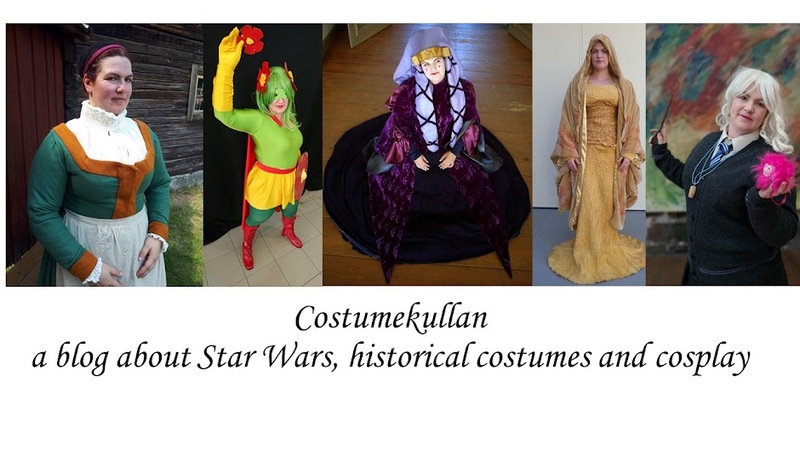 This makes me really happy since all my 18th century gowns have suffered from those b´humps and wrinkles, but apparently professional costume makers have that problem too. 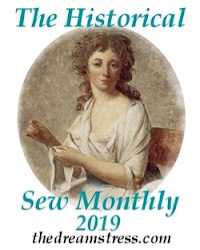 I am getting better, and hopefully by the next time I sew something 18th century I will be able to eliminate the sleeve hump, it's a matter of easing and gathering the sleeve towards the armscye in the best way. My sleeveheads have simply been too large compared to the armscyes. Here's a picture that I found, and I've circled the top of the shoulder. It was more visible from the side and the back, but for some reason I couldn't find any screen caps of that.